Just weeks before the European elections in June the democratic debate seems once again to have been diverted by recurrent problems: Europe is expensive, Europe is technocratic, Europe has no borders etc... It is in an effort to refocus debate on the real issues that the author tries to show, in a concise, accessible manner that these fears are unfounded and that often they are nothing but myths. By referring to his experience and the most striking encounters of his life, Pierre Lequiller offers his personal thoughts on the issues at stake in the campaign. 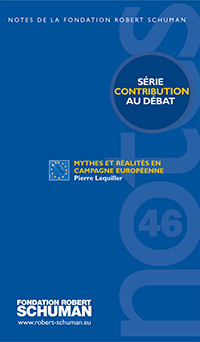 With the vision of a convinced, committed Europe as a backdrop the author offers the following for discussion: that of political Europe that is taking control of its future.